Opened to the public since 1903, the Isabella Stewart Gardener—a 15th-century Venetian palace museum featuring more than 2,500 pieces—is obviously a renowned fixture in the Boston art scene. But what many visitors don’t know is that it boasts an eclectic music schedule every season. And to top it off, the Gardner got a bit of a facelift this year with the opening of its new 70,000 square-foot wing, completed on January 12th. And one of the wing’s focal points? 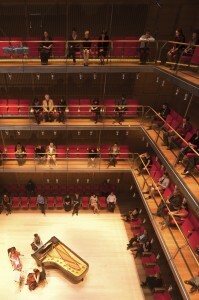 The 296-capacity Calderwood Hall performance space. 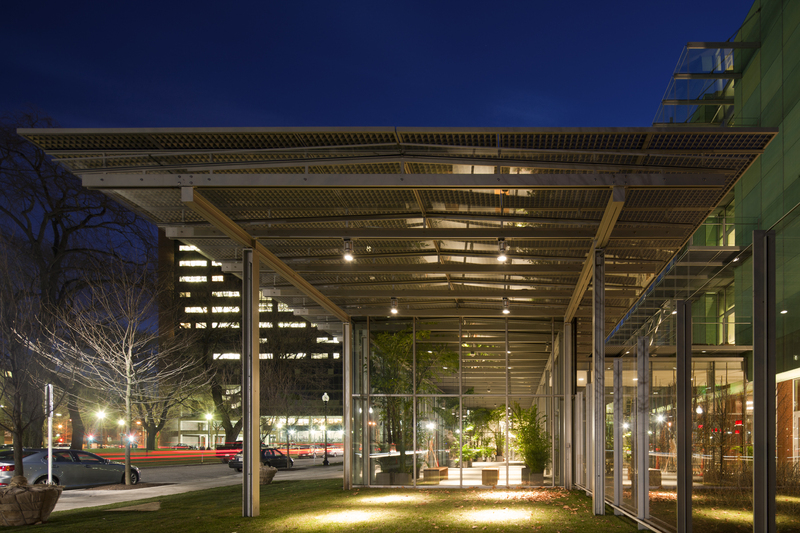 While the Gardner isn’t new to hosting performances, I wanted to get a closer look at the ins and outs of the new space, and how it’s fitting in with the museum’s goals. So, I got in touch with the Program Production Manager—a Boston-based Northeast University music student turned working professional—Kevin Kenkel. Jason Schneider: Let’s talk about Calderwood. Are there any particularly challenging aspects in the new space? Kevin Kenkel: The hall’s biggest achievement is its in-the-round design. It’s a cube with 3 levels of balconies, one row of seats each. Our music director Scott Nickrenz likes to say “everyone has a box seat”—which is true, because everyone is in the front row. There is no raised stage, but there is a 30×30 foot performance space around which the ground level audience sits (about 118 people). The total capacity is 296, so it’s a pretty intimate feeling throughout. However, its unique design presents the challenge of properly positioning performers. We spent a week in November trying out lots of different piano positions, including deciding whether to keep the piano lid on or off (we keep it off). We also tested different stage placements for piano trios and a jazz trio too – performers need to comfortably interact with each other on stage while still maintaining a natural position for the audience to view. It was tricky but we’ve mostly got it down now. JS: A lot of eclectic musicians and groups have been coming through. How has that been fitting in with the museum’s “updated” direction? KK: The new addition doesn’t so much update the Gardner but complements the original building and adds to it. Basically, we have more space now to try new things, particularly in Calderwood Hall. Scott’s programming will look familiar to most of our repeating visitors, but the performances have moved from the Tapestry Room, a beautifully restored space in the historical building, to a state of the art acoustically tuned experimental music hall. It’s safe to say that even if someone has already seen a piece performed at the Gardner before, its performance in the new Calderwood Hall wouldn’t look or sound anything like it has in the past. JS: How about concerts outside the space. Are there any odd or unusual places in/around the museum where you host performances? How do these work? KK: Generally if there is a performance outside of Calderwood, it’s in the courtyard of the historical building. The Museum has been doing this a long time before I came here. Musicians generally set up either in front or in back of the courtyard; we can only fit about 5 people total when we do that. DJs will set up in that spot too for some of our evening After Hours programming. During the opening celebrations we also had an oboist on the balcony of the Dutch Room overlooking the courtyard. That was cool, but he was completely isolated up there for hours. If we need to amplify anything in there, we set up a small PA. The courtyard of the palace is cavernous—not really the best for listening to live music, but it’s a cool environment to watch a performance regardless. JS:Talk to me about your transition from “Boston music student” to “Boston music professional.” It’s a great scene for concert music, and I’m curious as to how the NEU education has helped you out in such a great market. KK: I just got really, really lucky landing this job. About 50% of my job is coordinating all of the technical details of the performance hall and concerts—lights, sound, stage management, etc—and the other 50% is maintaining the rest of the A/V technology throughout the museum. I love music of course but never thought I’d be able to land full time employment working in an institution like this, to be honest. In terms of how NEU helped me, I had been running live sound there since 2009 and I got comfortable with working with all sorts of professional musicians, including chamber performers, so the transition to the Gardner was easy for me. I get to meld my technical “geekiness” here with my love of music. I think that is pretty rare and I feel very fortunate to be able to do so.